Planning your wedding day should be a beautiful process that brings you joy and happiness. It should represent “the road” towards the road down the aisle and there is no reason not to have some fun along the way. In most cases, however, the truth about planning a wedding is not as glamorous as two future newlyweds might think. The good news is that we at Basic Invite have created a helping hand that no two future newlyweds should be without. We offer one very big tip for all of you and that is to make your website! As your big day rapidly approaches with the speed of light and panic might set in there is no need not make the best of all the help that will come your way. When it comes to weddings, people always seem to want to help out. The best way to have someone help is to have them make your own wedding website. You will quickly find out that this is one of the most helpful things you will have done. The day you make your wedding website you will realize that it will save you a tremendous amount of time. Once you start planning for your wedding you will quickly realize that “time” seems to evaporate and things seem as if they are not getting done. This is the part where panic sets in. There are numerous benefits to making a wedding website. The most important part is that everything you need is in one place, at the touch of your fingertips. The great part about making your wedding website is that it can be created exactly as you wish it to be. 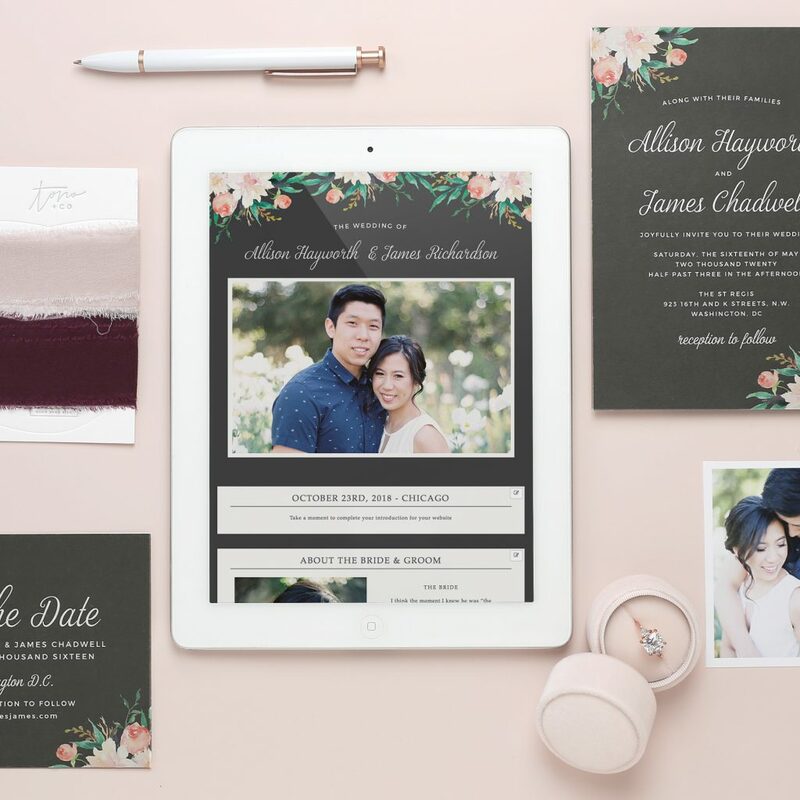 Having the possibility to customize everything will create a unique wedding website that defines both your styles and characters. Imagine having all of your guests at the touch of a button. By making a wedding website you can provide all of your guests with travel information that will help them. You can provide all of your guests with directs to the venue. Having your guest call and ask for directions before the ceremony begins is something that happens often. Besides this being an extra worry it might also mean they might show up late and the last person to enter your ceremony should be the bride. One of the most common question that a couple gets asked is “How did you meet?”. You can avoid all that repeated storytelling and focus on your celebration by creating a page that tells the story of how you two met and how the proposal took place. Less talking, more dancing and celebrating. They say that a photo is worth 1000 words and we at Basic Invite believe in the visual arts. Sharing your photographs with all of your guests is as personal and as intimate as a wedding should be. Making your own wedding website is one of the best decisions you will have made. We at Basic Invite want to help make your wedding preparations become an experience that relaxes you. Having an amazing time while planning for your big day is what we are all about. Start making your wedding website today, so you can relax tomorrow.